On Monday morning, we’ll wake up to a few hours of snow with 1-4 inches of accumulation before noon. Then following dry weather on Tuesday and Wednesday, a warm storm will deliver a lot of snow on Thursday and Friday, with snow potentially continuing through the weekend and into early next week. We might see multiple powder days in a row and snow totals measured in feet, favoring the southern and central mountains. Not too heavy, not too cold, not too deep, not too shallow but jussssttt right. The recent storms in Sun Valley, Idaho have offered up a daily dose of free refills that keep us coming back for more. Head up now for the first tracks or make plans for that spring skiing getaway. Go Now. Sunday was dry, mostly sunny, and comfortable with high temperatures in the 20s. Now on Monday morning, a cold front is approaching and snow showers are starting for the western mountains just before sunrise. Below, the radar animation from 330am to 500am shows activity picking up. Monday morning's cold front will be a fast mover with a limited amount of time for snowfall, roughly between Monday sunrise and Monday noon. The short time for snowfall combined with limited moisture will keep snow amounts low, generally 1-4 inches, with the most snow falling at mountains that are furthest to the west. Below, the CAIC WRF 2km (high resolution) model shows the projected snowfall for Monday morning. It’s fun to start the week with new snow, and because most or all of the snow will fall after the 500am snow reports, many folks likely will not be out in the morning to take advantage of the fresh flakes. Of course, it’s just a couple of inches, so it’ll ski nicely, but Monday won’t be a real powder day. From Monday evening through Wednesday afternoon, expect dry weather. Tuesday should be sunny and cooler with high temperatures in the upper teens to low 20s, and Wednesday will be mostly cloudy and warmer with highs in the upper 20s to low 30s. The short version is that we’ll likely see snow every day from late Wednesday night through next Tuesday, February 19th. 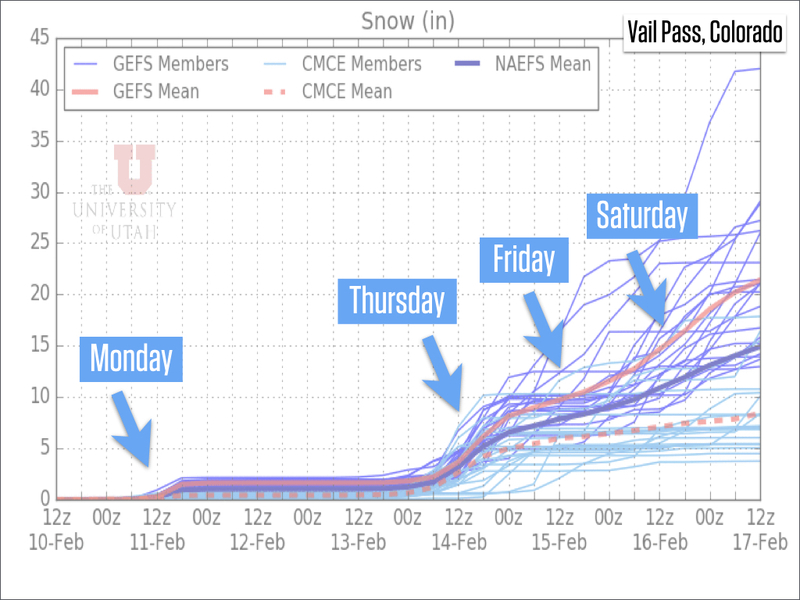 This is excellent news and chances are high for multiple powder days, favoring the southern and central mountains. The longer version is that there is a bit more consistency in the forecasts for the exact timing of the snowfall, though lots of uncertainty remains, and also, the first half or 2/3rds of this stormy period could be warmer with higher snow levels and thicker, surfier snow. Wednesday night through Thursday night is when we should see the first round of intense snow. Amounts should be significant, with 4-8 inches in the northern mountains and 10-20+ inches in the south-central and southern mountains. Ordinarily, this would make Thursday a no-brainer of a powder day, but consider that we’ll see strong winds which could affect summit lift operations, and also, the abundant moisture with this storm will be accompanied by warm air and snow levels could rise as high as 8,000-9,000 feet at times. This elevation is near the base elevation of many ski areas, and while I think most mountains will see all snow and not really any rain on the hill, the snow should be the heavier, thicker, surfier variety. Also, a lot of thick, heavy snow, plus wind, could markedly increase avalanche risk which is notable for backcountry skiers and this might also close some roads. For expert avalanche forecast information, please read the forecasts from the Colorado Avalanche Information Center’s (https://avalanche.state.co.us/) and the Crested Butte Avalanche Center (http://cbavalanchecenter.org/). After Thursday night, all of the latest models are trending toward a forecast with additional waves of snow continuing on Friday and Saturday, and then a stronger and colder portion of the storm could arrive on Sunday into Monday. This means that we might see snow on Thursday, Friday, Saturday, Sunday, and Monday with a potential for five powder days in a row. 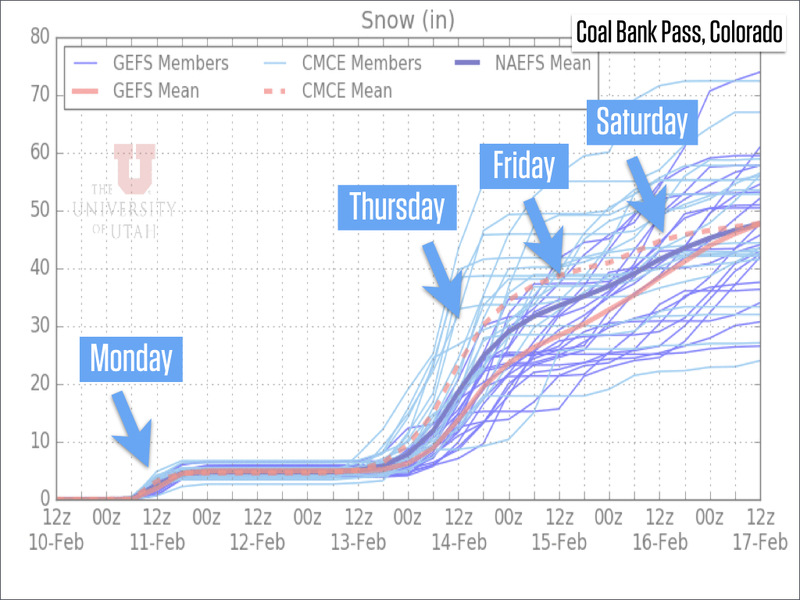 The University of Utah multi-model ensemble continues to show the potential for the upcoming stormy period. The northern mountains could be in the 8-16 inch range by late Saturday. The central mountains should see more snow, maybe 15-25 inches by late Saturday. Winds from the west-southwest during a lot of Thursday and Friday could favor Monarch, Crested Butte, and Snowmass. 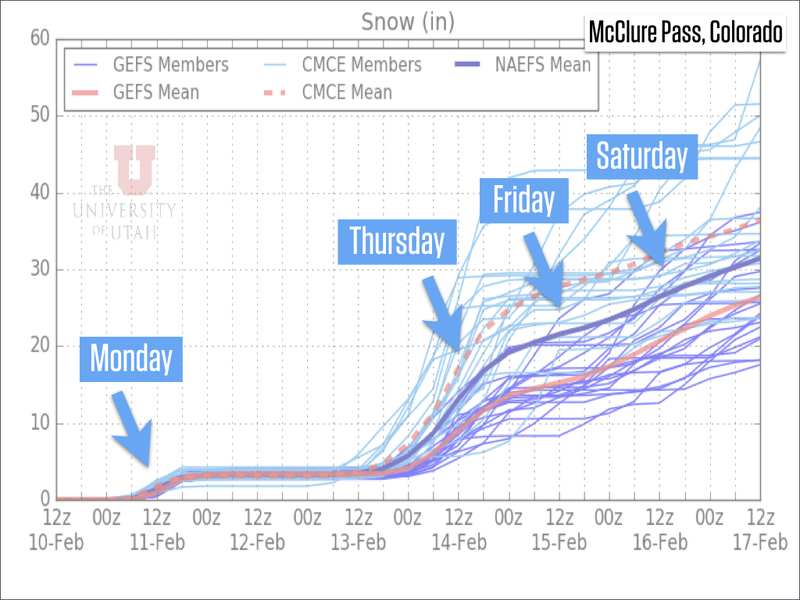 The southern mountains are favored for the most snow, perhaps more than 30 inches by the middle of the weekend. Silverton could see the most snow, followed by Wolf Creek, and Telluride and Purgatory can also do ok with a wind direction from the west-southwest. 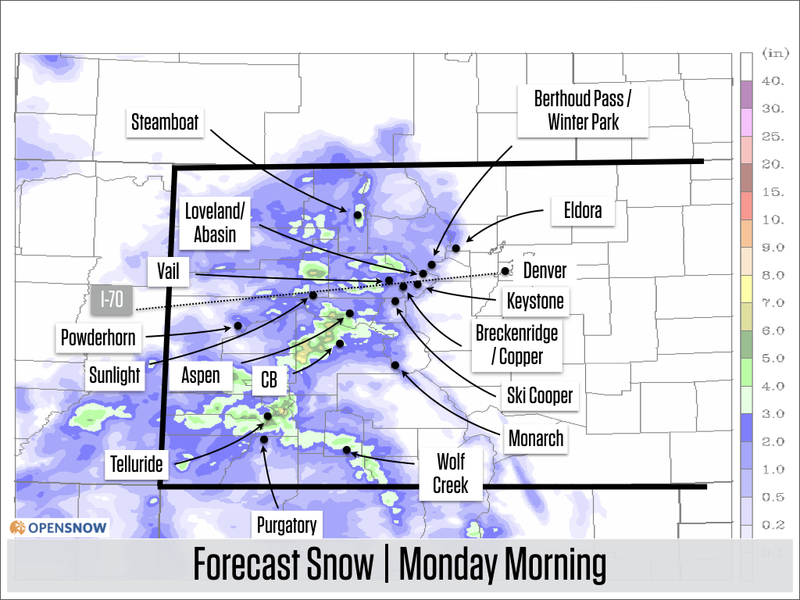 I am always cautious about over-promising snow amounts, but with so much moisture heading into Colorado, forecasting large accumulations is reasonable. What happens after Saturday is still tough to pin down. I think we will see snow continue on Sunday and Monday, with colder temperatures, less moisture, and different wind directions, so the areas favored for the most snow could change compared to what we’ll see on Thursday, Friday, and Saturday. Stay tuned! Because there is so much going on between Thursday and next Tuesday that I covered above, I haven’t spent much time looking at the forecast beyond about Tuesday, the 19th. The longer-range models do show that a cool and active weather pattern should continue across the west through at least about February 24-25th, so it’s likely we’ll see additional storms, though it’s no use trying to pin down the details at this time as there is too much variability in the forecasts. My next update will be on Tuesday morning.